We're just over one week away from Christmas and a little over two weeks away from 2016. This year is winding down quickly, which means only one thing to motocross fans—Supercross is just around the corner. Before we know it, the gate will be dropping on the new season. And with it comes all the regular speculation and questions. Who's going to win? Who will be the biggest surprise? What will the track at Anaheim 1 bring? With all this in mind, we thought that a shot from the 450 main event at last year's Anaheim 1 was an appropriate image for this week's Weekly Photo. At the time this photo was taken, no one knew that Ken Roczen would win; no one knew that Ryan Dungey would ultimately win the championship; no one knew where any of these riders would end up. That's what makes anticipating the new racing season so fun—the unknown. 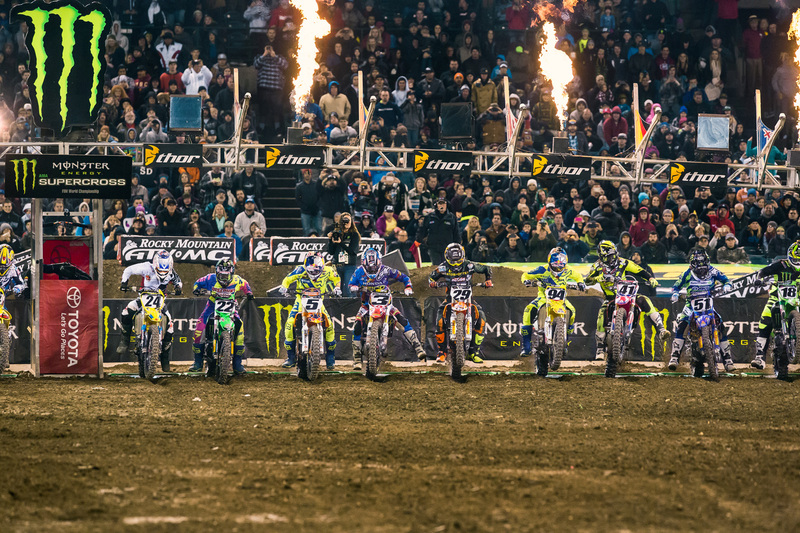 The 450 Class blasts off the line for the first main event of 2015.